Y-DNA (father’s, father’s, father’s branch), mtDNA (mother’s, mother’s, mother’s branch), and finally autosomal DNA (leaves, twigs, and branches from all directions) has paved the way for adoptees to reconnect with their biological family. I don’t think I have found a genealogist who has done an autosomal DNA test who hasn’t been contacted by an adoptee who is somehow related to them. Some test sites have made things deceivingly simple for many genealogists. Many of whom wait for a wiggling leaf to guide them to their family or a smart match to fill in leaves. These genealogists don’t know the fun they are missing! The following is a brief step-by-step adoptee helper guide for people who have done autosomal DNA. 1. How many total cMs do you share? (cMs is the way DNA is measured.) Segments (little pieces of DNA) are measured in cMs. The more cMs you share the closer your relationship. 2. Don’t use the test site’s relationship estimate (3rd to 4th cousin). Enter the total amount shared in DNAPainter’s cM Relationship tool. Click HERE. This will provide other possible relationships. Keep in mind when working with an adoptee you will usually be looking for half-relationship matches. Determine the possible relationships. If you end up with a close family relationship - please, no rock throwing. If it is a male he may not have known. If it is a female she had her reasons. She may have longed for someone to confide in for years. 3. Use the Shared Matches tool to see if you find the adoptee among a group of matches you have already identified. You may need to add some twigs to your own tree in this process. If you have a fully leafed tree you should have at the very least all of your grandparent’s through five generations and their children, and who they married. (Really healthy trees do this for 12 generations.) Genealogy is a process. Add to your tree as you make new matches. 5. Have more than one public tree. Upload your tree to each site where you have uploaded your DNA data or have taken a test. You will be amazed at the response. 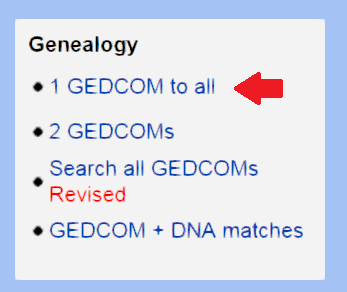 Wise genealogists have both a link to WikiTree AND a Gedcom on GEDmatch. You can download your tree file (called a Gedcom) from wherever you built it and upload it to GEDmatch in less than 5 minutes.) Don’t worry if your tree has errors; most people’s do. Other genealogists will help you sort your errors and they are usually pretty darn nice when they do. If you're certain your tree is right, send them screenshots of your documentation and DNA triangulation results. 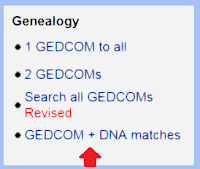 A recent observation I have made--- EVERY newly uploaded Gedcom or link to WikiTree on GEDmatch may help no less than THIRTY adoptees move forward in their quest to find their family. 7. Finally, keep in touch with the adoptee who contacted you. Welcome them to the family. Understand that you may end up a shoulder to cry on if their parents reject them or they discover a parent is not the kind of person they had hoped and dreamed. Let them know you are a member of their family who does care. If no adopted people have contacted you yet, seek them out. You’ll find them. They are the people who don’t have trees or have a one-sided tree with no names you recognize. Contact them. Let them know they have found someone in their missing family. Be their angel. The rewards are profound (and addictive). P.S. Please, if you are or have family in Australia encourage your relatives to test and please upload to GEDmatch. I need to knock down some brick walls. I love writing about GEDmatch. It is one of my top favorite genealogy tool sites. 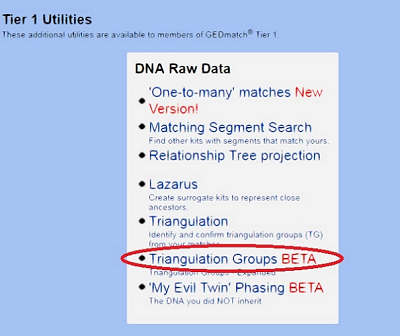 I often use GEDmatch in conjunction with WikiTree and the interactive DNA Painter shared cM Relationship tools. With three sites open at the same time I can bounce back and forth between tabs to get a “bigger picture” and make notes in my GEDmatch DNA Workbook. If you haven’t uploaded to GEDmatch this is my favorite video tutorial for doing so. CLICK HERE. In my opinion, this video by Angie Bush remains one of the best. Seven minutes into the video the instructions begin. Curtis Rogers fanned the spark of an idea which resulted in the bright light that now illuminates the path to find family whether using GEDmatch for traditional or genetic genealogy. GEDmatch has tools for traditional genealogists to compare Gedcoms quickly, eliminating the eye-crossing study of trees. You can compare two Gedcoms to each other or your Gedcom to the entire database of millions and millions of surname entries. To keep you from missing someone in your line, if a match doesn’t have the same ancestor but has a different family member in their tree you can discover this by setting your own parameters. You can catch anyone with a similar name, or spouse’s name in the same geographic area within a given time frame. How awesome is that? This tool aids with Y surname project studies as well. When autosomal DNA came along GEDmatch seemed for a long time a best-kept secret of many genealogists for comparing matches who tested at different companies. If you have heard the term “fishing in all the ponds,” dive into GEDmatch and experience ocean fishing. 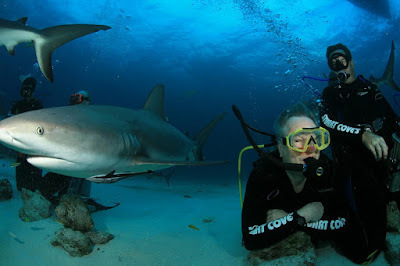 When I mention “ocean fishing” Curtis Rogers does not fear the sharks as you can see in this picture -- Curtis not only works hard, he plays hard. That’s Curtis in the front right of the image. I'm honored Curtis agreed to this interview so everyone can get to know this Yankee Doodle Dandy a little better. He celebrated his eightieth birthday on the 4th of July. Please share with us a little about your life outside of GEDmatch. What do you like to do to relax and take a break? I look forward to semi-retiring, climbing on a cruise ship and getting away from pressure for an extended period. I say “semi-retiring” because I would go crazy if I did not have my computer and some work to do. At least 8 hours working on GEdmatch projects and doing my “day job” work when I can. My day job is a Professional Guardian. I need to visit and handle the affairs of my wards. What countries have you visited that created an “I’ve been here before” feeling (if any)? I have lived overseas, been around the world seven times, visited where my ancestors lived, but sorry to say, I have never had a deja vu feeling. At what age did you first get interested in genealogy? In my teens when a distant relative wrote asking me to fill out a form about my ancestry. Have you had any big surprises when you were studying your family history? Not really. It is nice to know I am distantly related to both George Washington and Winston Churchill. Not yet but it would not surprise me. What changes have you experienced in genealogy since you started doing it? When I started there was no such thing as personal computers and the internet was still 30 years away. We did a lot more research in places such as musty county courthouses, libraries and cemeteries. Where were you and what were you doing when you had the first “A-ha” moment for creating a program that would compare Gedcoms? I don’t recall but it grew out of frustration for spending hours emailing back and forth to try and find common ancestors with DNA matches. When autosomal DNA came into use for genealogy the interest in finding common ancestors increased exponentially. How long did you discuss the idea with others before you were put in contact with John Olson? No others. I just asked John if he could develop an algorithm to match family trees for the Rogers Surname group I ran. He is an absolute genius and developed a program that I knew could be beneficial to genealogy researchers. At what point did you decide to make GEDmatch publically available? What were some of the obstacles you had to overcome to make GEDmatch a reality? Lack of money and equipment. 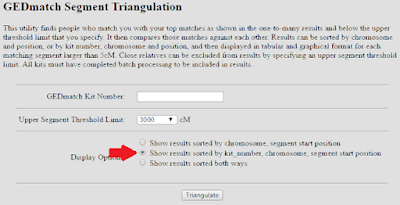 Was expanding into tools for genetic genealogy a logical next step? Who suggested it? I don’t recall if John developed the program on his own but if not I still give him full credit. Please share the story about when the servers went down and the decision to monetize part of GEDmatch so you could keep servers up and running. In the early days, our servers were in a remote location that we had difficulty accessing. Something as simple as a thunderstorm could knock them out. There were periods when we would be offline for weeks at a time. It is amazing that many of our early users stayed with us. I am not sure at what point we developed Tier 1. 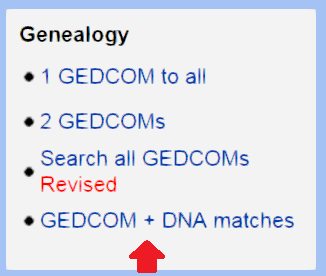 When did you first notice GEDmatch was really becoming popular with genetic genealogists? Probably when my wife stopped asking why I was spending so much time on this silly project. This happened when her friends sent her emails praising GEDmatch. Have you noticed an uptick in membership since people have been made aware that law enforcement will be using the site? Things seem pretty much the same now as before. Usage always is increasing and the trend has continued. 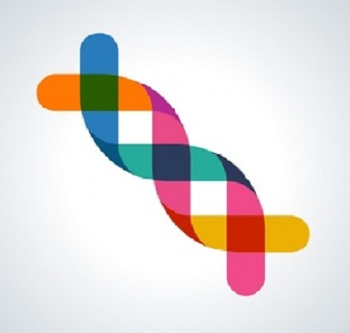 Where do you imagine genetic genealogy will be in the next ten years? There are so many more programs we want to add to GEDmatch. I believe even with our beta program, Genesis, we will be making a big leap forward in the usage of genetic genealogy when we get the program in its final form. What are your wildest imaginings for genetic genealogy in the future? 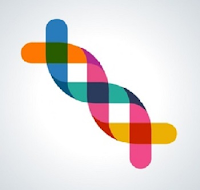 Genetic genealogy will be one small aspect of personal genetics. It will be common for people to have their genome tested. Hopefully, they will have full control of their results, then they can choose how their data can be used. If a doctor needs information then that part of their genome can be made available to him by the person who was tested. If the owner is interested in genealogy, They can use the appropriate part of the genome for that. Etc for other potential uses. What benefits will the new Genesis tool provide? In addition to being able to find matches with many DNA tests that are not traditional genealogical tests, we hope the data will be more sensitive. Any best guesstimate as to when Genesis will release? My best guesstimate was that it will be ready by last Christmas. After that, I gave up guesstimating. If there were something users of GEDmatch could do to thank you for this wonderful gift you and John Olson have brought to the field of genealogy, what would it be? Continue doing what they are now doing. GEDmatch has the most intelligent, creative, innovative, supporting group of users on the internet. Most of all they are caring. They care about family, about helping others (such as when having difficulty on our site), and have been there for GEDmatch with support and understanding whenever we have difficulties. We at GEDmatch thank them. I want to thank Curtis again for taking time from his busy schedule to share with us. Take a moment to show your appreciation to these wonderful geniuses at GEDmatch by uploading your Gedcom (no matter how small) or link from WikiTree. From this searching grandma, Happy Finding! And, I’m still having a blast! If you haven’t yet done so, I recommend you use WikiTree as your free public family tree to share with others. 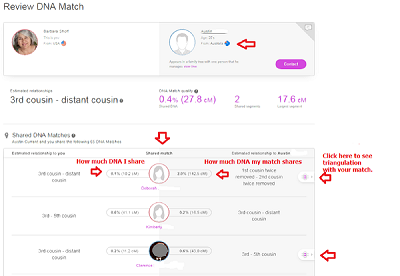 WikiTree’s unique concept of having a single-entry per ancestor allows you to meet cousins you may never meet any other way. (I have found a bunch and many of us have even gotten to meet in person.) Some genealogists who are members of WikiTree do a DNA test and others don’t. WikiTree provides a way for you to connect with both. Here is a screenshot of only a part of WikiTree's "Get Started" page. They keep score of their membership statistics which is growing by leaps and bounds making WikiTree one of the fastest growing free online genealogical tools today. You can do searches on this page and there are links to all sorts of other interesting information. You can find more facts and information about WikiTree HERE. The best way to find out about how to use it is to give it a spin. You can signup HERE. A curious person, I like to get to know more about the creative geniuses who are behind the tools that are driving the engine of a new resurgence of people interested in finding their families' roots. I am honored and thrilled Chris Whitten agreed to do this interview with me. 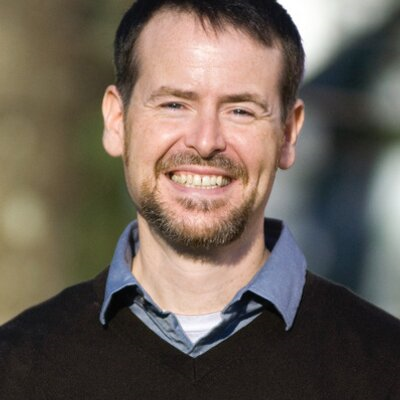 Chris, please share with us a little about your life outside of WikiTree. What do you like to do to relax and take a break? I have a wonderful nine-year-old daughter. She is the light of my life. In my free time I do a lot of gardening and landscaping. I build stone walls. I really like to be outside and work with my hands. Some of my day is filled with mundane administrative tasks and problem-solving, of course. But I try to discipline myself to spend some time each day on a project that moves WikiTree forward. That's what keeps WikiTree improving, and what makes working on it personally rewarding. I think I always had an interest in family history. The objects and heirlooms, especially ... the medals and mementos of my great uncle who died in World War II ... the model ships my great-great-grandfather carved to look like the ones he sailed in when he was young ... the pewter plate passed down through the hands of a dozen generations. When you're young I think it helps to have something that you can hold in your hands. That makes history and your ancestor's stories come alive. When I was 17 my great-aunt, Rebecca (Bartlett) Nally, helped with my first family tree. She was a great genealogist and a wonderful family leader, by which I mean she was one of those people who help keep a family together. She helped with my whole tree, including the parts that weren't her own. Have you had any big surprises when you studying your family history? One amusing surprise when I took a Y-chromosome DNA test a decade ago: I didn't have any matches with my own surname (Whitten) but a half dozen with my wife's surname (McClellan). We joked that I should have taken her name when we got married. I assumed that there might be one of those euphemistically-named "non-paternal events" in my recent history. On the other hand, it was only a 12-marker test. And many Whittens and McClellans came from the same Scottish-English borderlands region, so the matches could go back before surnames. Still, I didn't have any Whitten YDNA matches for almost ten years. That actually leads me to my most pleasant recent surprise. My Whitten brick wall was broken through last year and there was a Revolutionary War veteran on the other side! I was contacted by a man named Keith Whitten who found the profile of my ancestor Samuel Whitten on WikiTree. He said that Samuel was the brother of his ancestor and that their father was Richard Whitten, a private who served for three years in the American Revolution. I asked Keith to take a YDNA test, and sure enough, we're a perfect match at 37 of 37 markers. Very cool. I was super excited about this. Where were you and what were you doing when you had the first “A-ha” moment for creating WikiTree? It wasn't a single moment. I organized my own and my wife's family history onto web pages in 2005, in time for our wedding. In part, this was just to get all the cousins and aunts and uncles straight in my mind before sending out invitations. :-) But also because weddings are important family events, and they're an opportunity to share and grow the family history. I wanted to get everything organized. I wanted to know what was known, and what was not known. Although I didn't have the time to do it then, I wanted to make the web pages wiki. I wanted to enable family members to browse the pages, see what was missing, and be able to add it right then and there. Thinking about it being wiki led to thinking about it being global. A family doesn't have clear borders around it. Families overlap. Infinitely. If I invite my cousin to add to the tree, she would add relatives and ancestors who aren't directly related to me. 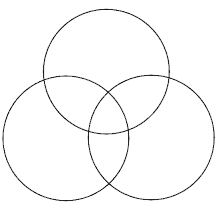 Our families are like overlapping circles in a Venn diagram. Every family circle is unique, but overlaps with others. We all connect. What talents did you already have that enabled you to believe you could create WikiTree? I've been creating community websites since 1995. My first business was a networking site for libertarians and free-market conservatives. At the time that I had the idea for WikiTree, described above, I was working on a site called WikiAnswers, a collaborative Q&A site. How long did you mull the idea over before you took action? I registered the domain name WikiTree.com in 2005, but I didn't have time to work on it until I left WikiAnswers in late 2007. What were some of the obstacles you had to overcome to make WikiTree a reality? The biggest challenge was privacy. I didn't know how to handle that for a long time. It's one thing to say that we're one big family. That my cousins should be able to add her cousins, and her cousins can add their cousins, etc. But all these cousins shouldn't be able to see everything about each other. The idea for Trusted Lists was a real breakthrough for WikiTree. Another obstacle was the high level of expectations that genealogists have for family tree software. Genealogy software has been around since the 1980s, growing and improving. 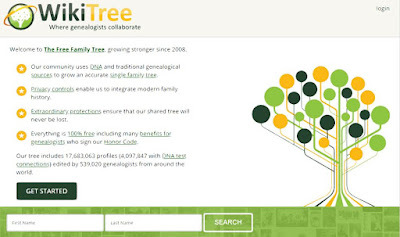 WikiTree had to develop a lot of features and functions before genealogists would take it seriously. The combination of DNA testing and a single family tree means that most people won't have to research their family history. They can take a DNA test and almost immediately see a rich, deep genealogy that has been created by their cousins. Some already can. I know many genealogists don't like this idea. Saying that a simple DNA test will give you your family history raises their hackles. But together we're making this possible, and it's a good thing. Not everyone is a genealogist. Not everyone wants to do research. By sharing what we learn, by putting it together on a single family tree, genealogists are giving a wonderful gift to everyone else. We do the genealogy. They spit in tubes. I think we will reconstruct the genomes of our ancestors. What new tools do you hope to develop in the future? We were actually working on collaborative chromosome maps for ancestor profiles, to move in this direction of reconstructing our ancestors' DNA. We pulled the plug on this for privacy reasons. I'm disappointed, but it will happen without WikiTree. WikiTree needs to focus on our core mission of collaborative growing the tree. Our ancestors' genomes will be hosted elsewhere. For our core mission, collaboration is key. 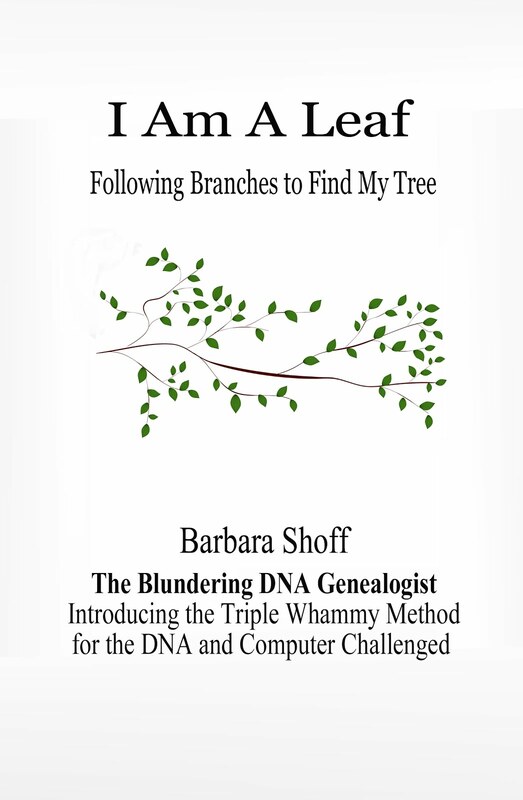 It's relatively easy to get genealogists to share their research. Many will share their GEDCOM. But integrating their research and collaborating – really working together to fix mistakes and solve mysteries -- is not easy. So, we are always working to make collaborating with other genealogists easier, and more fun. We're improving search and matching. We're looking for better ways to introduce cousins. We hope to do some of this with X-chromosome matches soon. There are always a hundred things on the to-do list, most of which have been suggested by community members. I want to thank Chris for this incredible interview. Update: I decided just linking didn't show up enough in the interview and decided to add Chris' Samuel's full URL. https://www.wikitree.com/wiki/Whitten-56 Once you click on it click the descendant's icon so you can get a better idea of one of the innovative features of WikiTree. I'm still having a blast. You can copy and paste your results from GEDmatch into any spreadsheet program such as Excel or OpenSource. I created a DNA spreadsheet workbook which contains the following: One-to-many page, Graphic Tree, Bar Chart, CSV file, Matching Segments, Triangulated Segments, and Gedcom + DNA. 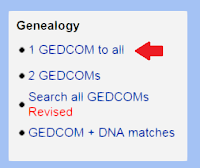 The One-to-many and Gedcom + DNA are on the free part of GEDmatch. You will need to join Tier 1 to access and run the rest of these fabulous tools. You will need to make a $10 donation. Joining Tier 1 for a one-month donation can save years of time figuring out who the common ancestors are you share with your matches. Some people view it only as a verification of their research. Discovering what's behind the walls, family secrets, adventures, and meeting often unknown living family members for me is what genetic genealogy is all about. Explanations of your results from Tier 1 tools can be found on several of my previous posts. When I am done with running the tools this is what the sheets at the bottom of my workbook look like. To copy different tool results into a workbook simply select all (Ctrl+A) right click “Copy,” open a blank spreadsheet page, right click your mouse and Paste. Or click Paste on the spreadsheet toolbar. Use Ctrl-A to highlight everything, Right-click Copy. Open a spreadsheet and click Paste. 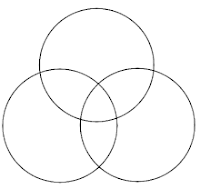 A little circle spins for a while and a pop-up might tell you what you are pasting might look a little different than what you saw on the GEDmatch page. Don’t worry, you didn’t do anything wrong. Simply click “OK.” The circle will start spinning again and then you will see what you copied appear. The “One-to-Many” page might take a minute or two for the page to fully load. If you look at the scroll bar on the far right of your screen when it is all the way to the top it has finished loading the page. Click to open a blank sheet for the next set of results. I adjust the column widths on the “One-to-many” workbook page by sliding the lines between the alphabet letters at the top of the spreadsheet page right or left. The alphabet letters denote the columns in the spreadsheet. If you don't know how or are afraid of spreadsheets read my post, Easy Peasy Spreadsheets. I am so thankful I listened when Jim Bartlett told me I really needed to start using them. The learning (and for me fun) is in the doing. After you paste your One-to-many page you will see that column “N” is an empty column. I make it wider and give it the heading MRCA (most recent common ancestor) and add notes under it. When the name of the person or grandparent couple is known I add that information. Be sure to click on the save icon frequently. Or you can do Ctrl+S. On the One-to many page I study the Gen and Total cM shared information to help me determine relationships with my matches. If I don’t know the relationship to a match I add notes of my best guess using the genetic distance and/or the results of “One-to-one comparison” totals which are found by clicking on the blue letter “A.” The One-to-one comparison gives more detailed results and the total amount shared can vary from what you see on the One-to-many page. Gen 1= Parent, Gen 2= grandparent, Gen 3= great-grandparent, Gen 4= 2nd great-grandparent. If I don't know the exact answer I might just note "4th great-grandparents" until I figure out exactly who it is. One of the things I had trouble with is the fact that an MRCA (most recent common ancestor) can be a grandparent couple instead of just one person. Word to learn: Nibling. This is an aunt/uncle, niece/nephew relationship. 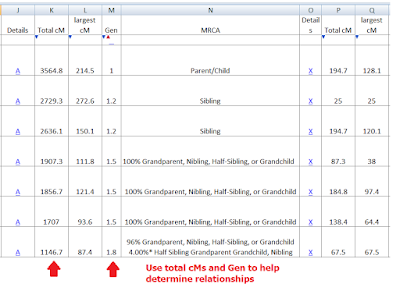 I check the total cMs shared using the free online DNA Painter cM Relationship chart that also provides odds for possible relationships you could share with your match. Below is the DNA Painter tool I use to help me figure out the relationship with my match. 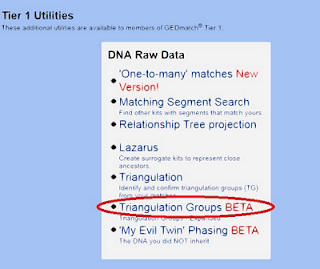 I run Tier 1 Tools and select Triangulation Groups Beta Tools for three of pages I include in my DNA Workbook. Each one goes on a separate sheet. The Beta Tools gives you Graphic Tree, Bar Chart, and the CSV file. I love studying this page. 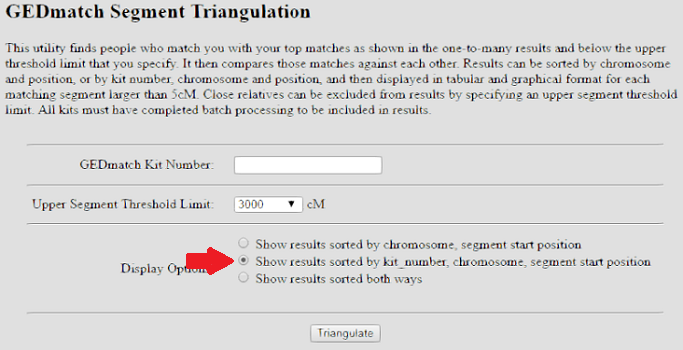 It shows which chromosome and position you match with a person BUT it can be confusing because it is two dimensional and doesn’t show triangulation so there is no way to know if the match is on your maternal or paternal line. This is another good sheet to make notes on. I insert a column just before the colored graphic by right clicking my mouse on the cell that contains the letter “J” at the top of the page and choosing “insert.” A good note to make is what their name or alias is on their testing site. Download these results if you are used to working with spreadsheets and understand sorting. You don’t need this sheet to find your genetic family. I prefer to work with Sheet-5. Though I can’t view the trees from the downloaded spreadsheet, this is a handy reference page for getting around the new GDPR EU (General Data Protection Rules for the European Union) that has resulted in everyone who is living shown as HIDDEN HIDDEN. You can edit this sheet and use it as a reference. Replace the hidden/ hidden with the name of your match by using Ctrl-F, enter the kit number and search your One-to-many page. Or you can enter the Gedcom file number in “User look-up” which is found on the landing page. When you use “User look-up” you may find your match handles multiple kits of others who share the same most recent common ancestor (MRCA) with you. 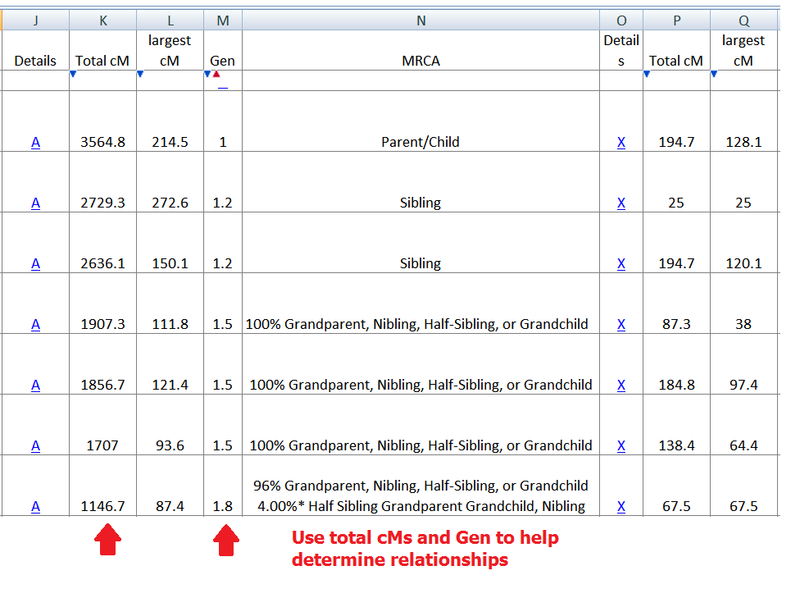 I insert an additional column on the Gedcom + DNA spreadsheet and add the name of our MRCA and note if this person is a maternal or paternal match or A or B match when I am working with an adopted person. I also like to clean up my downloaded pages by deleting the stuff at the top of the downloaded pages. You can do that by going to the numbered rows at the far left of the page. Click on the row number that contains the lines of copy you want to delete. This highlights the row. Right-click and choose Delete. If your results are scrunched up so you can't read the page, or you see a bunch of ### where numbers should be, slide the lines between the alphabet letters that indicate column to the right. Play with your sheets to get them the way you want them. 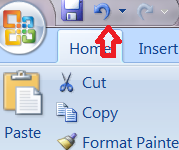 If you make a mistake when working with your spreadsheets use the swishy back arrow button. You can rearrange the position of your DNA workbook pages by clicking on any sheet heading and dragging it right or left.